Customize Taskfeed to capture your business data with the same flexibility as customizing in Salesforce. You can create custom fields in Taskfeed Boards, Taskfeed Tasks and beyond. 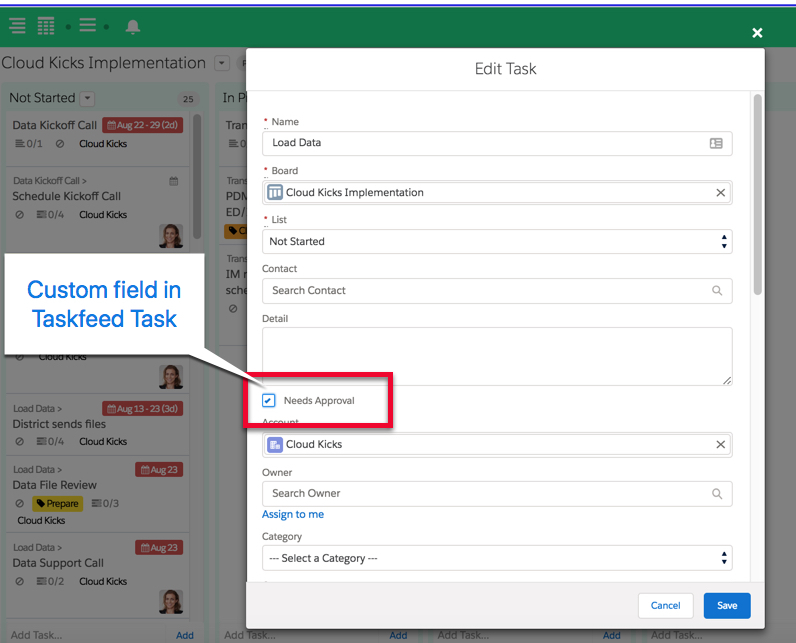 Use custom fields to capture information related to your unique business needs, such as a Task type or by relating Taskfeed Boards to other records in Salesforce, including Custom Objects. 💡Help your team identify Tasks by their priority by creating a custom picklist field on Taskfeed Task with values such as Low, Normal or High to prioritize each task as needed. When you create a custom field in Taskfeed Task or Taskfeed Board, that field will only be included in the record page layout by default, which is not used in the Taskfeed tab. Field Sets display what you see in the Taskfeed pop-up windows! To display custom fields in the Task or Board Edit pop-up windows or the detail side pane when you select a Task or a Board in the Taskfeed tab, the field must be included in the appropriate Field Sets. 💡Relate Taskfeed Boards to a Project (custom object) record in Salesforce. When you create a custom lookup relationship in Taskfeed Board with another object in Salesforce, the Board’s Tasks won’t automatically be associated with the related record. If you want the Board’s Tasks to also be related to that record, you must a) create a lookup relationship in Taskfeed Tasks with the same object and then b)include that custom field in common with both the Board and Tasks to the Taskfeed Board Field Copy Field Set found in the Taskfeed Board field sets. Drag and drop the custom field you have created onto the page layout. 💡Add Notes to Tasks with rich, formatted text, hyperlinks and images.